No matter how much the Indianapolis Colts are hurting or struggling, they can always count on beating the Tennessee Titans. The Colts (3-4) came in having lost two of three, including blowing a 14-point lead in an overtime loss last week at Houston. 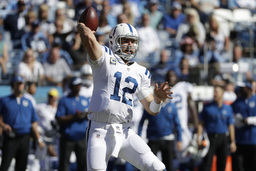 But Luck improved to 8-0 against the Titans with yet another comeback win. He finished with 353 yards passing and three TDs, the last after Tennessee went up 23-20. The Titans (3-4) saw their two-game winning streak end. They can't explain why Luck has their number despite his changing supporting cast. "He's that good of a quarterback he's going to make players make plays," Titans coach Mike Mularkey said of Luck. T.Y. Hilton caught seven passes for 133 yards, including a 37-yard TD . The Colts shook off 12 penalties for 131 yards in pulling out their 15th win in 16 games against Tennessee. The Colts were missing wide receiver Donte Moncrief and tight end Allen, and Jack Doyle caught nine passes for 78 yards to fill in at tight end. "We as a team, if we're dealt those cards, we embrace it," Luck said of the injuries. "We welcome everybody in and say this is what you've got to do to help this team get a win. That's the beauty of it." Colts kicker Adam Vinatieri kicked a pair of field goals, and the second, a 33-yarder with 3:46 left in the third quarter gave him an NFL record 43 consecutive field goals made. His first tied him with former Colts kicker Mike Vanderjagt who made 42 straight between 2002 and 2004. "I'm happy that we won the game and that this is a little bit to go along with it," Vinatieri said. The Colts pounced on the Titans with an onside kick after Luck's second TD in the second quarter. Titans tight end Phillip Supernaw had a chance to scoop up the ball only to fail, and Robert Turbin recovered for Indianapolis at the Tennessee 35. The Colts had to settle for a 28-yard field goal by Vinatieri after having first-and-goal, but the onside kick helped the Colts go up 17-6 with 10 straight points. The Titans opened a game driving for a touchdown for a second straight game, and Mariota being a perfect 5 of 5 for 47 yards wasn't the best part of the possession. Under pressure, Mariota dumped a pass off to left tackle Taylor Lewan, who ran 10 yards for the TD. Lewan was so wide open he looked back as he ran into the end zone for the first TD by a left tackle for this franchise, according to Pro Football Reference. The Titans lost left guard Quinton Spain to an injured right knee on incomplete pass in the second quarter. He was carted off to the locker room. Then cornerback Perrish Cox went down late in the same quarter when linebacker Sean Spence appeared to land on him, and Cox was carted to the locker room, where he was evaluated for a concussion. Neither returned. Mularkey said after the game that Spain was being taken for tests of a sprained knee. The Colts go home after splitting a two-game swing to host Kansas City. The Titans wrap up a three-game homestand hosting Jacksonville on Thursday night.